Guangzhou Wenshen Cosmetics Co., Ltd. 17-Year International Microblading and Micropigment Manufacturer. 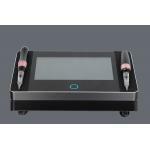 This is a new touch screen digital semi permanent makeup micropigmentation tattoo machine device for eyebrows,lips,eyeliner,areola,scalp,MTS etc.This new permanent makeup machine have two different handles,you can adjusr the needle length from the pink circle part of the pen.The penel is touch screen which have more fashion and charming looking.The machine works very stable and low noise.it is a good choice for professional master and also for new starters. Each needle is pretty sharp. The blade area is larger. The relative focus is more extensive. Coloring is more solid. These hard blades are pre-configured to the perfect angle, resulting in more hygienic and efficient procedures. Disposable hard blade are sterilized by EO Gas. If the machine is broken down in one month after customer's receiving the parcel, please ship back and we will send the new one. We will pay the "back and forth" shipping. 2. 1<X<6 MONTHS: 3 alternatives. 1) Ship back and get it repaired, and we will pay the "back and forth" shipping. 2) If Customer can not wait for one month during repair time. We will send a new one and 50% of the machine should be paid. Ship back the broken one. We will pay the "back and forth" shipping. 3) Find a local repair store, we will pay for the repair fee on seeing the receipt. Ship back and get it repaired. Customer pay the shipping back. We pay the returning. PS: If "Back and Forth" shipping less than 50 USD, we will be responsible for total amount. If more than 50 USD, we will share the shipping with customers. Dear friends, thank you for your visiting. If you have any question about our LUSHCOLOR blades, please feel free to contact us. Your inquiry will be replied ASAP within 12 Hours.